It took a long time, but I finally managed to get a few long overdue trade packages out this month. Gavin was the first one to hit me back with something and here (almost all of) it is! 2017 Diamond Kings Artist Proof #'ed 85/99.. Starting off with one of the cards I knew was coming. I love Panini's current run of Diamond Kings, but aside from a couple blue frames from 2015 and three discount blasters worth of 2016 (where I scored that sick Corey Seager auto/patch /10 from my All-Autograph Team post), I don't have very much of it. Money has only gotten tighter since those discount blasters, and they were hard to justify even then. So it's nice to get a little taste like this once in awhile. 2005 Absolute Memorabilia Absolute Heroes #'ed 205/250.. These first two cards nicely highlight what I said about keeping my Fergie Jenkins collection in the Pick Five Blog Bat Around post the other day. While the career run collection can feel like a futile, endless grind, he has tons of fun modern stuff to collect that keeps it interesting. Though his post-career stuff is probably at least 95% Cubs & Rangers (Donruss absolutely loved him in a Rangers uni), playing for four different teams in his career helps vary it up just that much more. 2017-18 Panini Status D-Rose "Red" #'ed 190/299.. The checklist over on Cardboard Connection says this is a red parallel, but it looks way more pink or magenta to me. But anyway, I love Status & still needed a couple more cards to complete my Rose page, so this a great addition. I don't remember if I claimed at some point or not, but it's a really nice addition. Seen approximately a pretty good number of people say this reminded them of early Skybox and I am 100% on board with that assessment. These are on foilboard and all have the same background design, but the computer generated graphics on a stark white void (when the bottom half isn't mostly colored in reddish-pink) does feel noticeably nostalgic to me. 2008-09 Topps Tip-off Gold #'ed 66/99.. This is another one I'm unsure how I ended up with, but it's a worthy inclusion on the Laker page if I ever decide to go through with my idea of making binders of team pages out as a way to organize the nicer random baseball, basketball, & football cards I'm not too attached too but can't seem to and/or don't really want to get rid of. Of course I can't let a single post go by without sneaking a sketch card in there. But seriously though, getting back to the baseball with this sweet Gavin original of Kris Bryant! I think I have at least a couple of these already, but extra early Schwarbers are never a bad thing to have. 2006 Topps Rookie of the Week.. I have no recollection of this program at all, how hard they were to come by, or who the rest of the checklist consists of (this is card 24 of 25), but Ryno on the '83 Topps design is all I really need. 2011 BowChro Trey McNutt Prospect Auto.. I've never been much for prospecting, but even in the most meh designs with the most forgotten failed prospects, Bowman Chrome autos are always nice & clean. McNutt topped out at AA and is currently trying to keep his career alive on the indies. 2015 BowChro Prospect Purple Refractor #'ed 225/250.. Here's a nice purple refractor. I'm not sure yet, because it's mighty tempting to keep it for myself, but I might add it to my mom's pink & purple parallel binder whenever I'm next over there. Sands was a fairly high draft pick in 2014 and started strong, but injuries, ineffectiveness, and an influx of newer, much readier draftees lead him to being released this spring. As far as I can tell, nobody has picked him up since. He's only 23 though, so the clock on his career hasn't ticked down nearly as far as some of the other names in this post. 2015 BowChro Bruno Prospect Refractor Auto #'ed 199/499..
Another nice Cubs prospect auto, this one a numbered refractor version. Bruno is closing in on 28 and seems to be struggling mightily at AAA this season, so unless he comes on strong and can catch on elsewhere, he might be independent league bound as well. 2014 BowPlat Green #'ed 128/399.. This might be another dupe, but I'm not sure. This is from the last Platinum set before the brand went on a short hiatus, returning a couple years later as an only slightly retooled Walmart exclusive. Alcantara made the show with the Cubs but couldn't hit enough to stick on a team that was suddenly about to start contending. 2009 BowChro Prospect X-Fractor #'ed 179/250.. I'm typically not a fan of X-Fractors, but this version from 2009 is legitimately amazing. I wouldn't be nearly as dismissive if they all looked more like this one. Despite putting up generally respectable numbers, Rosa has bounced around the minors, independent, and international leagues for over a decade without ever being all that close to making the show. I've owned maybe a half-dozen (counting football) Inception cards ever because it's typically a higher end prospect product with barely any cards per box and is frequently quite hideous to boot. But the 2017 version looks decent, at least in magenta parallel form, and I'm happy to add any new #'ed Javy regardless, especially now that he's starting to fully realize his potential. 2005 Benchwarmer AJ Almasi/Laura Davis dual auto.. Always scan the backs, because they are the gift that keeps on giving! Haha, anyway, thank you Gavin! As of my June shipments, I finally have all the trade bait I picked up for you & others last year on COMC in-hand (so many Christmas cards! ), so I expect we'll be trading again soon. Hopefully it won't take me 18 months to get send stuff your way this time. This month's Blog Bat Around topic comes courtesy of It's Like Having My Own Card Shop, and sense of general malaise effecting many-a-card-blogger these days. So the question is, if I can only keep five specific card collections, what would they be? The first four were actually fairly easy for me, because I've thought seriously about downsizing frequently in recent years. Five was a tricky one though, and I am admittedly cheating all over the list. My sketch card collection is made of numerous specific sub-collections therein, I could convert small parts of certain collections that don't make the list to fit the second pick, and picks three and five are multiple, related collections under a single banner. But eh, it's my list. So let's get on with it then. 1.) Sketch Cards- Probably the one and only virtually untouchable collection I own. The 12 or 13 keepers amongst 15 I currently have waiting to be bailed out of COMC lockdown might put me over the 400 mark. This is my one true (and truly expensive, even though I rarely break the bank for any one sketch) cardboard addiction. I'm an artist, I love (primarily comic) original art, and I don't have enough space or money to own nearly as much as I'd like. 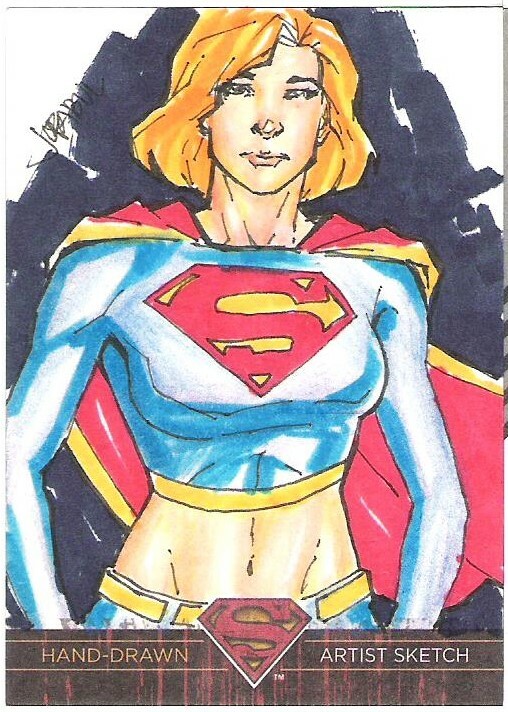 So sketch cards are basically the most perfect possible thing for me. I think I found out about them in 2007 or 2008 and I almost instantly fell in love. If I had to drop all but one collection, this is what I'd keep. No question. Pop Century Kristen Renton/Emilio Rivera dual auto.. 2.) Random Non-Sport/Other Sport Autographs- I think maybe it's just the thrill of the hunt with these. You can get some pretty decent names for surprisingly little coin sometimes, and every new score tickles the back of my brain. It's just pure fun, untamed, lead with your Id collecting. No real plan. Just see a cool addition for a good price and buy it. I quite like that. Eve Torres gold parallel #'ed /10.. 3.) Main Wresting PCs (Booker T, Eve Torres, Sarita/"Dark Angel" Sarah Stock)- As one of my earliest loves, not collecting more wrestling cards will likely go down as one of my great collecting regrets. These are the only collections I've been able to put considerable time and effort into, and I have no desire to give them up. Dakota Kai may be on this list someday as well (I saw a whole mess of signed stickers on her Instagram story the other day, and I am PSYCHED), but yeah. 4.) 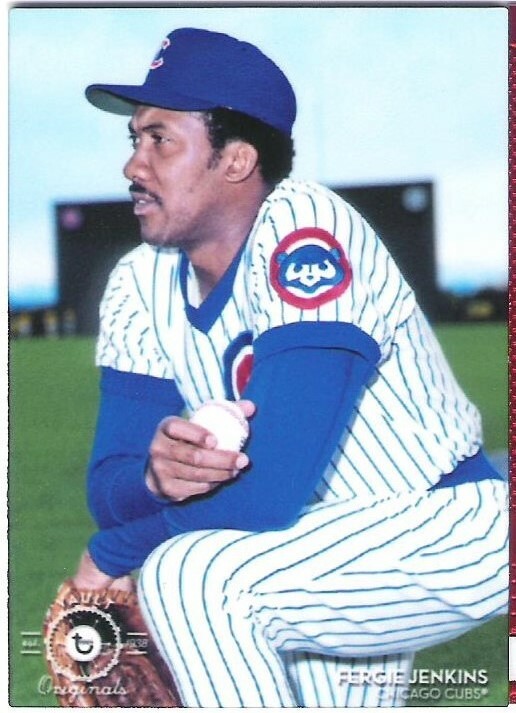 Fergie Jenkins PC- I wouldn't necessarily say this is my most favorite major sports collection, but it's the one where I feel like I have something to prove. To own a copy of every card released of Fergie during his playing career is one of my only real completionist collection goals, and I can't part with it. At least not until I've succeeded. Plus, he has a ton of fun modern stuff like the gorgeous Vault Metals above (and his autos are often very affordable) to chase to distract from the relative monotony of hunting for vintage & oddballs & such. 5.) 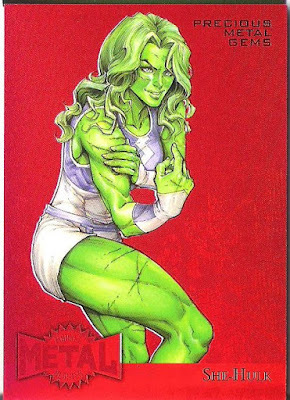 Comic Card PCs (She-Hulk and Rogue)- This was the tough one. Nothing else was quite jumping out at me like the first four. I thought just maybe higher end Marvel in general, but that's too loose and a tad difficult to define. But there's a good sized crossover between my She-Hulk (non-sketch) collection and higher end products. I have the above Precious Metal Gem from 2015 Fleer Retro Marvel and a few other items from higher end sets. As for Rogue, it's just a weird nostalgia thing. A lot of my stuff of her is from the '90s, and I've always regretted never being able to afford all those sweet early & mid-'90s comic packs they had at the grocery store back in the day. So there you have it. The, err... five-ish collections I'd keep if I had to dramatically shrink my collection. Thanks for stopping by! Seeya again whenever I get around to editing scans. If you follow me on Twitter, you may have noticed I'm getting a strong urge to start blogging again. I suddenly have a lot of incoming new material, and the desire to talk about it is back as well. I'll start off light right now though, because not much of the new hotness is here yet and I haven't scanned anything at all in a couple months. So for today, it's just a couple really cool, very cheap sketch cards I picked up on eBay back in the early spring. I think it was only around $8 total for the two of them. They are both by the seller, one Joshua Dyson. First up is WWE star Bayley. The wacky wavy inflatable tube men in the background were a brilliant touch on this sketch. Anyway, WWE has almost completely squandered the unbelievably amazing character work that made her probably the biggest star NXT had ever made to that point on the main roster almost from the jump, but anyone with a functioning brain had to figure that was gonna happen (see Wyatt, Bray). She's awesome and I still believe in her though. Ms. Marvel II (Kamala Khan).. The older I get, the less time I have for angsty, sad sack superheroes with pointlessly tragic backstories. So Kamala just spoke to me immediately, and I've been squirreling together a little collection of her ever since. 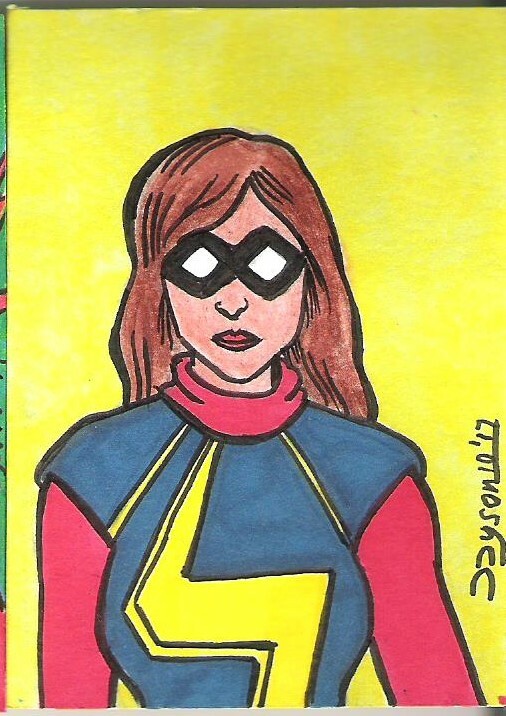 This is my second sketch card (not counting the one I drew myself), and I also have two 3x5" index card sketches (also from eBay, also pretty cheap), and a couple inserts and a magenta printing plate from various Upper Deck products. Also I think I might have a button of her? Anyway, as you can see, these are relatively simple sketches. But there is a lot to like about them. The large variance in thickness of the lines shows some very clear confidence in inking that I don't even have myself after more than a decade of being back at my drawing board. That the lines are still rather bold even at their thinnest gives the artist's style a fairly unique voice and makes the mostly flat colors really pop. It gives them a very cool, cartoony vibe. I also appreciate the relative rarity of the subjects. There's plenty of stuff of Bayley out there to collect now, but her autographs & relic cards & action figures & such often aren't often in my price range, and the opportunity to own original art of wrestlers is much, much harder to come by, especially cheap. Kamala's been around long enough now for her to show up in a few licensed sets & on the sketch cards therein occasionally (she also has one of the very best Marvel Legends figures in recent memory, which I also own), but there's still just not that much stuff available. 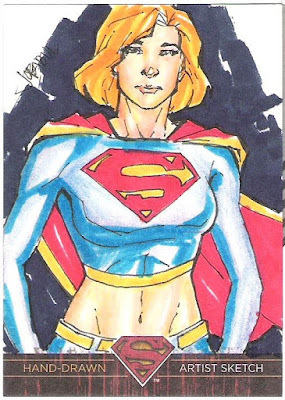 There doesn't seem to be much in the way of non-licensed original art out there of her either, be it sketch cards or larger work, so I gotta jump on what I can find. So yeah, these were a couple excellent finds and I'm grateful I was able to pick them up for so little coin. Thanks, Joshua. I hope you're out there somewhere still creating art.